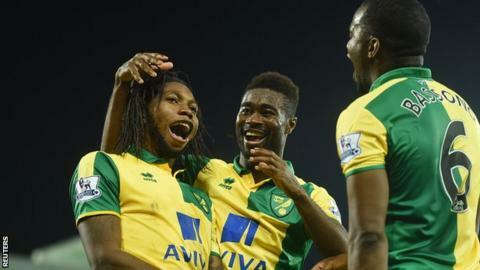 Alex Tettey's second-half goal gave Norwich a hard-fought win over 10-man Southampton at Carrow Road. Saints went a man down when Victor Wanyama was sent off, with Norwich scoring just three minutes later. Canaries' striker Dieumerci Mbokani had missed good chances from close range before the break, while Steven Davis forced the hosts' Declan Rudd into a fine save in the first half. Norwich move onto 23 points, just one behind Southampton. Ronald Koeman's side have now lost six of their past eight Premier League outings. The Saints manager dropped attacker Sadio Mane after the Senegalese player missed a team meeting. Wanyama's reckless challenge on Tettey changed the course of a game that had, until then, featured a lot of effort but not much high-quality football. The Kenyan had been booked in the first half, and there were few quibbles after he had lunged at the eventual Norwich match-winner. Norwich substitute Vadis Odjidja made a telling contribution to the game, setting Tettey up for the Norwegian to shoot home, left-footed, high into the net. Was Koeman's big call the wrong call? Southampton's official Twitter account gave Ronald Koeman's reasons for dropping Mane immediately after the teams were announced, an hour before kick-off. Originally slated to start the game, the former Salzburg player was left out after being late for a pre-match meeting. Mane cut a disconsolate figure on the visiting bench until he was called upon late in the match. The 23-year-old had featured in all 19 of his side's Premier League matches prior to this one, starting 17 of them, but he failed to make an impact in the time he had against Norwich. Their fine 4-0 win over Arsenal apart, Southampton's recent results must make for grim reading for Koeman and the club's fans. A yield of just four points from a possible 24 does not bode well, and although they are seven points above the relegation zone, Southampton are sliding towards danger. It remains to be seen whether Koeman elects to strengthen his squad early in the transfer window, or give his current players the chance to get themselves out of their rut. Norwich, meanwhile, have had a good festive season, with a return of nine points from 12. They are unbeaten in five at home, and their form at Carrow Road could prove to be vital as the season progresses. Alex Neil: "When Vadis came on, I thought he really injected some quality and creativity going forward, and he created the goal for us. "I'm over the moon with the boys in particular, because when you are going through difficult spells, there have been questions posed about them and me - and the best way to deal with it is to win games. "We've won some crucial games now and kept two clean sheets as well, so there are a lot of positives to take." Ronald Koeman: "I'm angry about the second yellow card from Victor because a player with his experience needs to know if you already have a yellow in a game, that you cannot do that tackle in that position on the pitch. "I agree that we were the dominant team, that we had the best chance in the game when Shane Long was put through, and we played some good football. "But it's so unnecessary what happened because with 11 against 11, still we are stronger than we showed here and we know we are in a difficult situation." After hosting Manchester City in the FA Cup on 9 January, Norwich will return to Premier League action at Stoke on Wednesday, 13 January. Southampton begin a run of three home games in a week against Crystal Palace in the FA Cup, then they host Watford and West Brom. Match ends, Norwich City 1, Southampton 0. Second Half ends, Norwich City 1, Southampton 0. Corner, Norwich City. Conceded by Gastón Ramírez. Declan Rudd (Norwich City) is shown the yellow card. Corner, Southampton. Conceded by Jonny Howson. Substitution, Southampton. Gastón Ramírez replaces James Ward-Prowse. Substitution, Norwich City. Martin Olsson replaces Wes Hoolahan. Substitution, Norwich City. Cameron Jerome replaces Dieumerci Mbokani. Substitution, Southampton. Sadio Mané replaces Dusan Tadic. Substitution, Southampton. Harrison Reed replaces Jordy Clasie. Corner, Southampton. Conceded by Sebastien Bassong. Goal! Norwich City 1, Southampton 0. Alexander Tettey (Norwich City) left footed shot from the centre of the box to the top left corner. Assisted by Vadis Odjidja-Ofoe. Attempt missed. Alexander Tettey (Norwich City) right footed shot from outside the box misses to the left. Assisted by Vadis Odjidja-Ofoe. Corner, Norwich City. Conceded by Virgil van Dijk. Attempt blocked. Vadis Odjidja-Ofoe (Norwich City) left footed shot from the centre of the box is blocked. Assisted by Robbie Brady with a cross. Second yellow card to Victor Wanyama (Southampton) for a bad foul. Vadis Odjidja-Ofoe (Norwich City) wins a free kick in the defensive half. Attempt blocked. Robbie Brady (Norwich City) left footed shot from outside the box is blocked. Dieumerci Mbokani (Norwich City) wins a free kick in the attacking half. Offside, Southampton. Jose Fonte tries a through ball, but Shane Long is caught offside. Foul by Cuco Martina (Southampton). Attempt missed. Dusan Tadic (Southampton) left footed shot from a difficult angle on the left is too high. Assisted by Maarten Stekelenburg. Attempt missed. Russell Martin (Norwich City) header from the centre of the box is high and wide to the left. Assisted by Jonny Howson with a cross. Corner, Norwich City. Conceded by Jose Fonte. Substitution, Norwich City. Vadis Odjidja-Ofoe replaces Nathan Redmond. Attempt missed. Alexander Tettey (Norwich City) left footed shot from outside the box is high and wide to the left. Assisted by Gary O'Neil. Corner, Southampton. Conceded by Russell Martin. Hand ball by Gary O'Neil (Norwich City). Jordy Clasie (Southampton) wins a free kick in the defensive half. Wes Hoolahan (Norwich City) wins a free kick on the left wing.